Minicircle DNA contains almost exclusively the “Gene of Interest” and its regulating sequence motifs. Redundant bacterial backbone sequences are completely removed. This results in a safe and highly efficient vector system meeting future regulatory requirements for gene therapy and vaccine products. PlasmidFactory offers reporter gene minicircles (luc, lacZ, GFP) as McBox®. Compare minicircle DNA with the corresponding plasmid in your experimental setting! The McBox® contains 100 µg each of certified minicircle and plasmid DNA which both include the reporter gene. 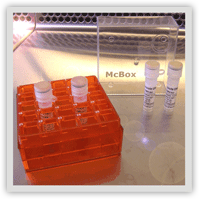 Currently the McBox® is availabe with the luciferase gene (luc) as well as the green fluorescent protein (GFP) and the ß-galactosidase gene (lacZ). With this new McBox® scientists get the opportunity to directly compare minicircle DNA and the corresponding “classical” plasmid in the individual applications in their own labs. According to prior agreement we produce your individual minicircle, using our unique, patented technology. Your plasmid containing the “Gene of Interest” (GOI) serves as starting material. Either by cut and paste or amplification by PCR, this will be inserted in to the so called parental plasmid. Intramolecular recombination of this parental plasmid leads to the minicircle DNA molecule containing almost only the GOI. The minicircle DNA based on our proprietary minicircle technology is worldwide patented and exclusively available only from PlasmidFactory. Minicircle DNA consists only of the specific GOI and a very short sequence which inevitably remains in the minicircle as the remnant of the specific production process. In comparison to typical plasmid DNA with the general portion known as the «backbone», comprising the genetic marker for selection (e.g. by antibiotics) and the so-called origin of replication (ori; for the replication of the plasmids in E. coli cells), minicircles are extremely small – down to half the size of the smallest plasmids. Since the backbone sequences comprise typical motifs of prokaryotic DNA and may also be methylated differently (CpG motifs), they hamper transfection of eukaryotic cells. As quality controls show, chromatographic purification carried out during minicircle production by PlasmidFactory results in the highest purity of minicircle DNA, in the quality range of ccc Grade DNA. For reproducibility of experimental data it is mandatory to use high purity DNA, since even trace amounts of contaminants may lead to significant artefacts in the experiment. The dissemination of antibiotic resistance genes and the uncontrolled expression of backbone sequences may have a strongly negative influence on gene expression and could elicit immune response of the target cells. In addition, it was shown that unmethylated CpG motifs contribute to the silencing of episomal genes. In vector development, it is, therefore, an important objective to produce supercoiled (ccc) plasmid DNA without bacterial sequences. PlasmidFactory is the first company in the world whose minicircle products meet these high requirements. The product is suitable for applications in gene therapy and genetic vaccination, for production of RNA and virus – i.e. wherever previously plasmid DNA was used. Minicircle DNA consists almost exclusively of the active sequences. This allows increasing the dose without increasing the amount of DNA. PlasmidFactory’s patented minicircle technology was developed for the production of high-purity minicircle DNA. 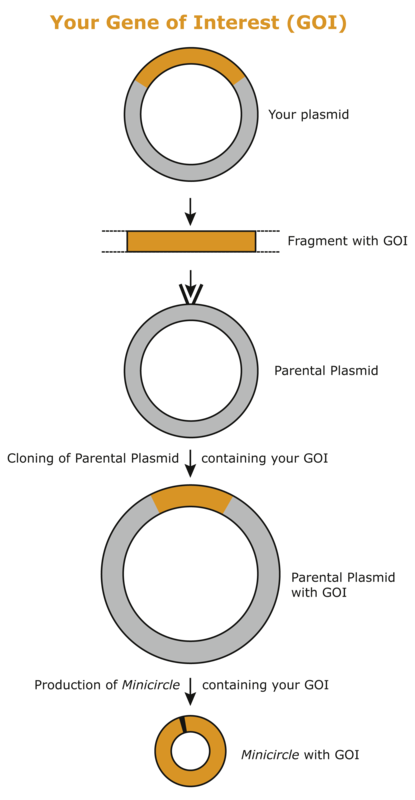 The starting plasmid, called the parental plasmid, is amplified in a special bacterial culture. Subsequent recombination yields two circular DNA structures – the minicircle and a miniplasmid. The miniplasmid comprises in addition to the encoding region for antibiotic resistance, among other things, the origin of replication (ori) essential for propagation in bacteria. Separation is effected by a special chromatographic procedure in order to remove the undesired plasmid molecules. PlasmidFactory produces both standard minicircle (In Stock products) and customized minicircle DNA. Minicircles have by now been tested in approximately 20 efficiency studies. In each case, expression from the minicircle was at least at the same level, but mostly significantly above that from the corresponding plasmid with the same expression cassette. Expression has been tested in various types of tissues, cells, animals and with various transfection methods (e.g. electroporation, sonoporation, lipofection, magnetofection, hydrodynamic injection, jet injection, etc.). The McBox® by PlasmidFactory comprises the minicircle and the corresponding conventional plasmid and is very well suited to comparative experiments in your laboratory. It is important to note that only equimolar comparison (same number of DNA molecules – minicircles or plasmids) is advisable. A run of cytosine-phosphate-guanosine nucleotides (CpG) in eukaryotic genomes is often methylated by DNA methyltransferases. In bacteria, this mechanism is used for delimitation of gene products. A negative consequence of such methylation can be a reduced expression rate of the affected gene. By now, it is possible for sensitive applications to design the target sequence so that it has a reduced CpG content or is completely free of CpG motifs. In its guidelines for medical gene transfer products, the European Medicines Agency (EMA; formerly European Agency for the Evaluation of Medicinal Products, EMEA ) recommends abandoning the use of selection markers, such as resistance to antibiotics, in plasmid DNA products (CPMP/BWP/3088/99). In the interest of increased safety, national bodies (e.g. Paul-Ehrlich-Institut in Germany; AFSSAPS in France; and MCA in the United Kingdom) have adopted this recommendation. In reaction, PlasmidFactory has developed a «minimized DNA» which comprises no antibiotic resistance genes or other selection markers, as well as no origin of replication, and yet is supercoiled: Minicircle DNA, i.e. homogeneous circular derivatives of plasmid DNA consisting almost exclusively of the preventively/therapeutically active transcription unit (cassette).